Happy Hump Day!!! Sorry....I just love that GEICO commercial! I made this beautiful card with the Tim Holtz Season Silhouettes Stamp set. First I stamped the background paper with Old Paper Distressed Ink. I distressed the edges and then sewed it to another piece of designer paper. The holly leaves are also from this stamp set. They were stamped in Peeled Paint distress ink . I fussy cut the holly leaves and adhered them behind the poinsettias. The poinsettias were cut with my Silhouette Portrait machine. I just LOVE that thing!!!! I added some lace to the middle and green tulle behind the poinsettias on the lower right corner. Go check out the other Design team members creations for some fabulous inspiration! 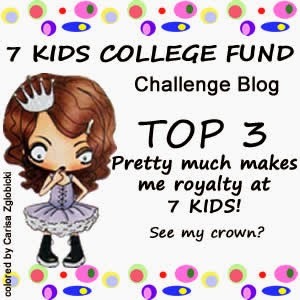 Our new Challenge starts today at 7 Kids College Fund Challenge Blog! Our theme is Anything Goes and you will be eligible for a gift certificate to spend at the 7 Kids College Fund Store if you happen to win! Such a beautiful Christmas card with those lovely bright poinsettias! I can see the camel roaming through the office now Mackie!! Love your card, it has a great old fashioned look to it. The poinsettias and holly leaves are so pretty!! Very pretty card! I love the traditional colors you used. Mackie, I just love your creations! Your style is fabulous! Love the poinsettias and stitching! Gorgeous card Mackie! I love all those Poinsettia's and the fancy lace trim!